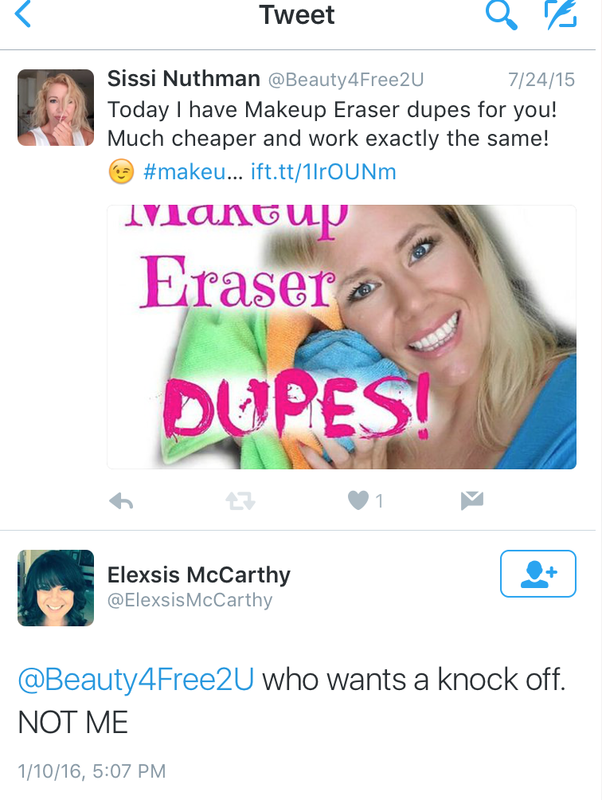 WHAT IS THE MAKEUP ERASER MADE OF & A CHEAP DUPE! The Makeup Eraser brand tries to keep it a secret, what the actual fabric of the Makeup Eraser is made out of and won´t clearly label anything, so everybody´s wondering: what is the Makeup Eraser actually made of? What are the ingredients? 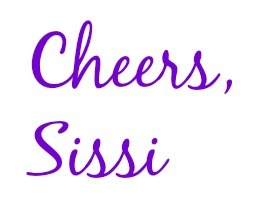 "The fabric used in our MakeUp Eraser features a very special proprietary blend of fibres." I made a screenshot because they seem to delete any kinds of clarifications on the ingredients. "It is NOT microfiber, but is a proprietary woven blend of polyester soft to the touch." You might have seen my Makeup Eraser Dupes? I´m getting contacted by the Makeup Eraser brand, because they don´t like me claiming to have found dupes (of course). They also don´t like, that I call the Makeup Eraser a microfiber. I had yesterday a conversation with a Makeup Eraser sales representative, that I wanted to share with you. She already commented on my video a month back, but I did not feel the need to respond. But yesterday I received a comment from a viewer and then the sales lady had the guts to respond to the viewer and give her the information of her Makeup Eraser Facebook page to buy the product. That is, when I felt the need to answer to her. 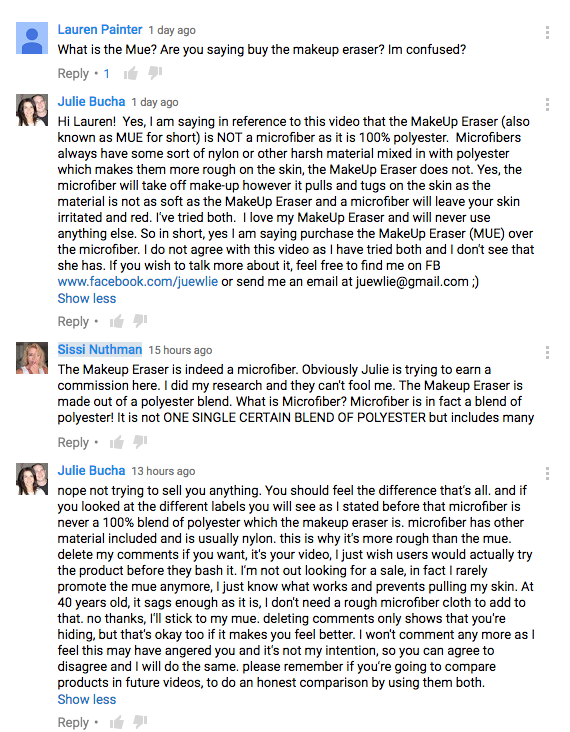 "the Makeup Eraser is NOT a microfiber as it is 100% polyester. Microfibers always have some sort of nylon or other harsh material mixed in with polyester which makes them more rough on the skin, the MakeUp Eraser does not." Sounds intriguing, BUT Nylon is a synthetic replacement for silk and has a soft silky texture- and polyester is our famous fabric from the 70s that has actually a tough scratchy feel to it. 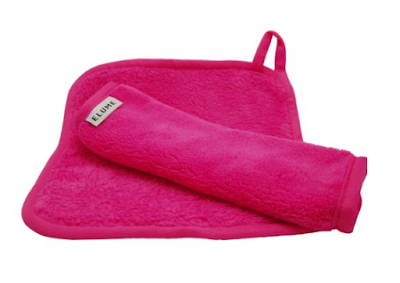 However, you can create a MICROFIBER with polyester that feels super soft. How? They weave polyester fibers smaller than the diameter of a strand of silk. Again: Microfiber can be ANY propriety blend of fibers and yes: it can be 100% polyester which for cleaning purposes is often used. You can buy thousands of cloths made out of 100 % polyester- this is NOT SPECIAL! I think it is actually quite funny that she thinks, that it is in any way special that the Makeup Eraser is a 100% polyester blend. Polyester is not special. I admit though that our regular microfiber cleaning cloth is very different from the Makeup Eraser- BUT: touch a plush baby blanket made from 100% polyester!!! Same feel. Same material. Probably also works great to remove makeup! LOL! BTW: The reason why I considered deleting her comment is, because she includes an unsolicited sales offer on my video -not because I have something to hide (like she thinks). What do I have to hide? Makes no sense. This is not the first time that I got feedback from the Makeup Eraser brand. The COO of the Makeup Eraser herself (Elexsis McCarthy) tweeted to me regarding my dupes video on 1/10/16 (see screenshot below), which I found rather unprofessional! If you go through her tweets, you will find many unprofessional tweets that I find very inappropriate for an COO (for example this one here). Since my Makeup Eraser Dupe video (that I published in summer 2015) I found many exact dupes btw that ALSO CONTAIN A 100 % Polyester blend. Nothing special. 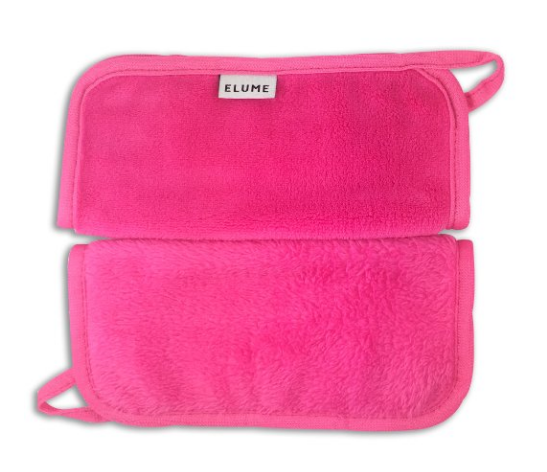 Check out this one by Elume- yes it has 2 different sides as well (a softer and a rougher side). I like that you can hang this one up to dry. The other problem I have with the Makeup Eraser, besides trying to trick us and pretending that they use a secret polyester blend, and that the COO seems very unprofessional, is that it is now a MLM company (Multi Level Marketing)- just like these annoying Younique, "It works" (body wraps and that crap) and other sales representatives that overflow the Internet and send their annoying messages to sell their products- literally like our Julie from above hops on videos like mine to try to sell her product. I will soon go in detail about MLM but in short: MLM is a controversial marketing strategy in which the sales force is compensated not only for sales they generate, but also for the sales of the other salespeople that they recruit. They are basically a pyramid scheme (which is illegal) pretending to be MLM. I wanted to also clarify that I have no problem if you love the Makeup Eraser! If it works for you, that is great. I have never tried it and simply don´t care for it. My reason for this post is simply to clarify that the ingredients of the Makeup Eraser are in fact 100 % polyester (which they admit) and that: Yes, it is a microfiber blend- no matter how many times Makeup Eraser claims it is not.